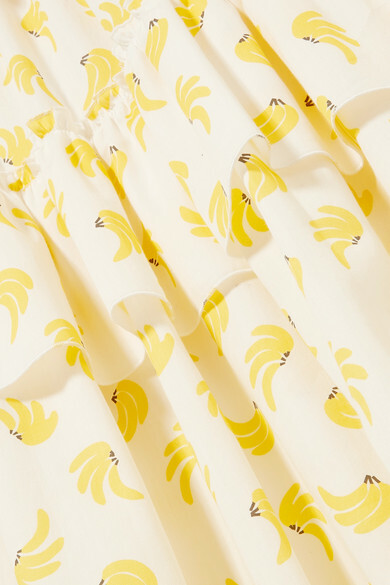 Anna Mason's 'Vita' dress is made from breathable cotton printed with tumbling bunches of bananas - the playful pattern is instantly mood-boosting and just as ripe for spring as florals. This tiered, ruffled style is elasticated at the cuffs to accentuate how puffy the sleeves are and has a self-tie belt to cinch the loose fit. Team yours with sandals. Shown here with: Rosantica Bucket bag, BY FAR Mules, Leigh Miller Earrings, Laura Lombardi Ring.